The original oil painting "Linville Gorge, Autumn, Wiseman's View" by Jason Rafferty. 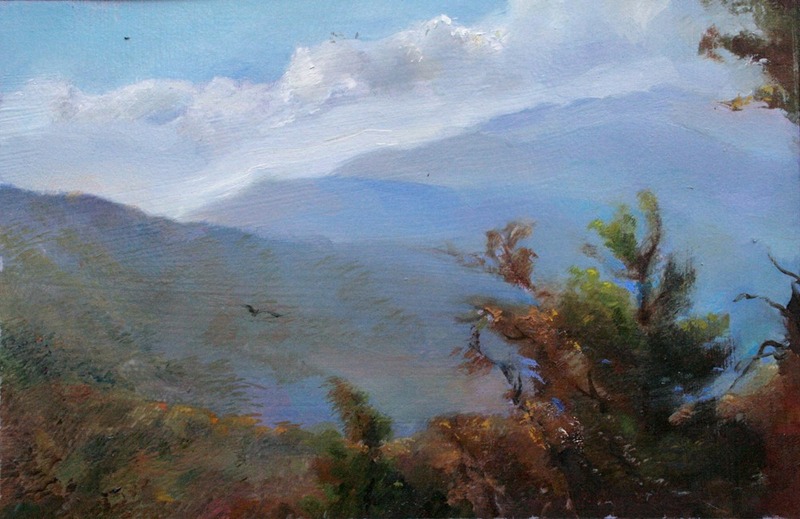 "Linville Gorge, Autumn, Wiseman's View" is an original oil painting by Jason Rafferty. The media is oil on paper mounted on panel, and it measures 9 x 6.5" plus frame. It was painted all prima in Linville, NC, overlooking the Linville Gorge. This piece comes with a custom frame and will arrive ready-to-hang. "I painted this scene during a twelve-hour painting expedition with my colleague, John Mac Kah. It is autumn in Linville, North Carolina, overlooking the Gorge, which I felt to be the Grand Canyon of the East!"